Meet Dr. Martin | Jeanne E. Martin, D.M.D. Dr. Martin was born in 1962 in nearby Bell Co. She was raised in Pineville and graduated from Pineville High School in 1980. She attended Morehead State University and received her Bachelor of Science degree in Biology in 1986. Dr. Martin then went on to earn her secondary teaching certificate from Lincoln Memorial University and moved to Louisville, KY where she spent the next few years working various jobs. She was accepted to dental school in 1992 and received her diploma in 1996. 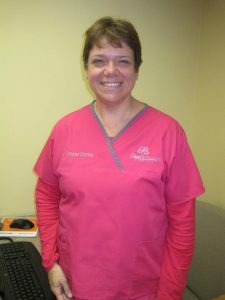 She moved to Corbin to take over her uncle’s (Dr. Sam Martin) practice at 406 Master Street in Corbin. The practice has been located in Corbin since 1961. Continuing the tradition of good family dentistry.